If your goal is perfect eyebrows, it’s time to take a serious look at microblading. But what is microblading and how does it work? Imagine waking up with naturally perfect eyebrows that you don’t have to pluck, shape, or trim. Actually, it’s not. It’s a new reality that many women are now experiencing, thanks to a technique called microblading. Yes, we realize a beauty regime with the word “blading” in it sounds kind of scary. Especially when it’s related to the face. But microblading is anything but scary. Microblading is an innovative solution that is changing the game for eyebrow maintenance. If the word sounds familiar, it’s probably because you’ve already come across multiple celebrities gushing over this new technique. But microblading isn’t just for the rich and famous. Microblading is for anyone who is sick and tired of clogging their bathroom cabinets with half-used eyebrow products that don’t do the trick. Microblading can make even the scraggliest of brows look naturally perfect. Yes, we realize this sound may sound too good to be true (most beauty products and services are, after all). But keep reading. Once you understand the ins and outs of microblading, your skepticism will vanish. We briefly covered the basic definition of microblading in the introduction. But let’s delve a little deeper. This way when your pals get eyebrow envy and ask you, “what is microblading?”, you’ll be able to give an educated answer. Microblading is a form of tattooing that uses ultra-thin, hair-like strokes to give you natural looking brows. Specifically, it is a form of semi-permanent tattooing that lasts from 1 to 3 years. 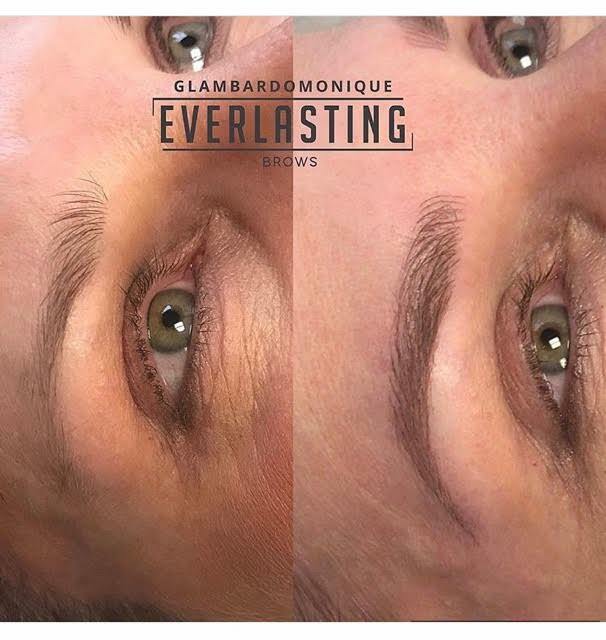 Besides the obvious difference in appearance, there are two other main differences between microblading and permanent makeup. The first difference is that microblading uses an iron oxide base. Iron oxide is a popular ingredient in many cosmetics, such as lipstick, foundation, eye shadow, and blush. Unlike the ink in permanent tattoos, iron oxide allows the color to softly fade over time until it finally vanishes. The second difference relates to the depth at which the color is implanted. With permanent tattooing, the color is implanted deeply. With microblading, the color is implanted into the upper layer of the dermis. A micro stroke that is too shallow will result in poor color retention. A micro stroke that is too deep will result in scarring and blurry looking strokes. Luckily, implanting the color to the correct depth is not a difficult process. Yes, it’s natural to be a little unnerved at the thought of a sharp object coming in contact with your face. But a microblade is unlike any other blade you’ve experienced before. A microblade is a tool sort of looks like an Exacto-knife. However, instead of there being one large blade, there are a lot of tiny microneedles. The esthetician takes this tool and dips it into the selected pigment color. They then make small strokes on the skin, following the brow shape you desire. Everyone has different pain thresholds. Therefore, it is hard to say whether or not you will find microblading to be a painful experience. If you’ve had your brows waxed or threaded before, then you will likely be able to handle the pain associated with microblading. Most people find it to be slightly more uncomfortable than threading. Before the procedure, a cream is put on your skin to help numb some of the pain. If you have a low threshold for pain, you should consider bringing along a stress ball to squeeze or some headphones to distract you. Wearing headphones will also help distract you from the sound of the blade scraping against the skin. Most people find the follow-up appointment to be a bit more painful than the initial appointment. Make sure you come in prepared to this appointment with something to distract you from the pain if you struggled in the first one. All in all, most people find microblading to be more uncomfortable than painful. Many describe it as a tiny scratching sensation. Certainly, the pain will not have you screaming or writhing in your chair. However, it is still good to come to your appointment prepared. Bringing supplies to distract you from the pain is just one aspect of preparing for your appointment. In order to prepare properly, you first need to make sure you block off the right amount of time in your day. A microblading appointment typically lasts about 2 hours. To make your appointment shorter, try to come with a brow shape in mind. Even better, come with your brows styled so your esthetician knows what you are looking for. If you have no clue what kind of brow shape will look best on you, don’t worry. Your artist can help you pick out the perfect one. If you use a retinoid cream, stop taking it a week before your appointment. Retinol thins out your skin and can cause excess bleeding. Other blood thinners, such as aspirin and alcohol, should also be avoided one week prior to your appointment. Make sure to drink plenty of water before your appointment and get a good night’s sleep the night before. Remember, microblading involves cutting into the skin. When the skin is cut into, a wound forms. Therefore, there’s going to be a healing process, just like there would be with any other wound. Many people who aren’t properly educated about the healing process tend to freak out and wonder if microblading was a mistake. Knowing what to expect in terms of appearance will help the healing process go smoothly. Day 1: Eyebrows look fantastic immediately after the procedure and your brows gradually get darker throughout the day. Day 2: Pigment reaches its darkest point. Week 1: Light scabbing begins to develop where strokes occurred. Week 2: Scabbing begins to peel and flake off. The skin revealed may not yet have a definite, visible color. Week 3-4: The pigment continues to oxidize and the intended color begins to reappear. However, some strokes will come back in patchy formations. Final Touch-up: After the final touch-up, you should be ready to reveal your beautiful brows to the world. The initial appointment lays the foundation for what your brows should look like. The touch-up appointment completes the look. While it can be nerve-wracking to see your brows flaking and peeling, you need to trust the process. Do not call your artist in a panic during the 6-week healing process. Staying on top of aftercare treatments will help the healing process go much more smoothly. Improper aftercare can result in pigment loss, discoloration, and even infections. Day 1-14: Do not allow any water, soap, lotion or makeup to come in contact with your brows for the first 14 days. Take baths to avoid water from contacting your brows. Day 1: On the first day, you’ll need to clean your brows every hour. Take a cotton swab and some distilled water and gently wipe the treated area. This will help reduce scabs from forming. After cleansing, lightly apply your aftercare cream (recommended to you by your Microblading Artist). Make sure your fingers are clean before applying and free of any lotions. Day 2-7: Apply your aftercare cream once or twice per day. Applying the cream more than two times per day can suffocate the skin and interfere with the healing process. After day 14: After this time, you can resume all normal activity. However, you should still avoid regional creams until after your touch up appointment. Microblading is an investment. Prices can range from $300- $2500. We strongly advise spending at least $300. Anything less tends to be on the low end of the spectrum in terms of quality and service. Research salons beforehand to find one that offers quality services. If you are ready to go ahead with the procedure, please contact us to schedule an appointment.